Search! is Textkernel’s semantic search software that helps you find the right jobs and candidates in your own database and in external sources, effectively and easily. Add this powerful semantic search technology to your job or CV database and increase your value. Textkernel makes use of semantic search technology that goes beyond keyword search and finds what you mean, not what you type. Enable job seekers and recruiters to easily search and find the most relevant jobs and candidates. Find candidates easily, effectively and efficiently. 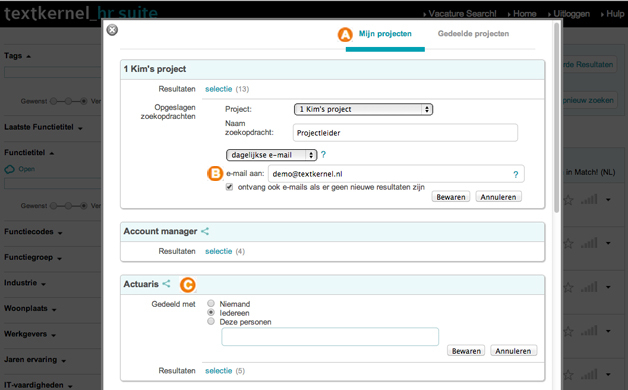 In a single search task you can search multiple (CV) databases, talent pools and social media. With Textkernel’s intelligent and user-friendly search and sourcing software you are able to find better candidates faster. Features: Job and Candidate Search! 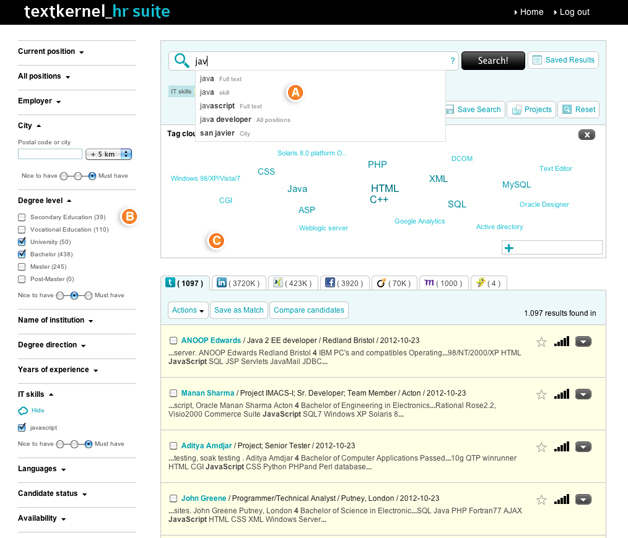 Textkernel’s Search! is based on highly advanced semantic search technology, wrapped up in an easy-to-use interface. Read about the technical specifications of Search! 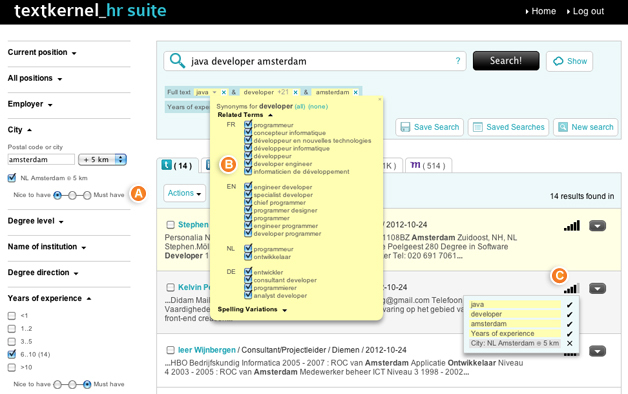 Textkernel offers semantic search: searching by meaning, not plain old keywords. This means that you can find what you are really looking for without being limited to the keywords typed. For example the keyword CEO in a resume does not automatically mean that the person is a CEO, but they could have worked for a CEO. 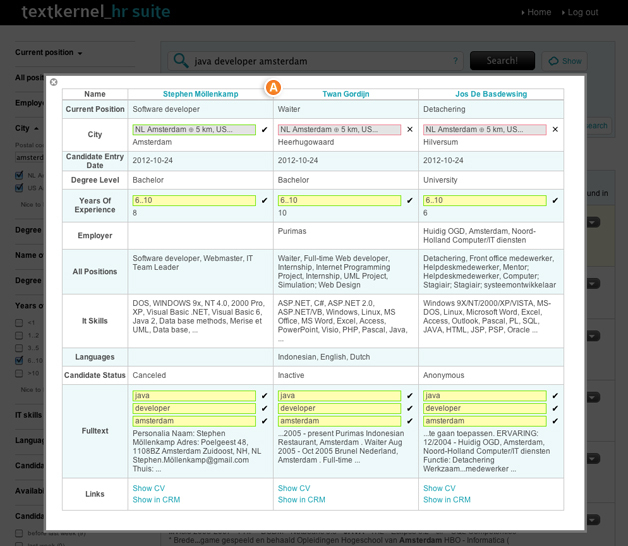 Textkernel’s technology can understand these types of differences. The user interface of Search! takes the complexity out of searching. Without any technical training, you can easily find the best candidate with the right combination of criteria. The various search features are set out below. The Search! engine has been specially developed to search for candidates on the basis of multiple search terms. Search! uses the knowledge in your CV database to specify the most unique combinations of candidate characteristics and display these at the top of the results list. You will then see the most attractive candidates first. In Search! you can search more widely than on the the terms you have entered. The application automatically translates your search terms into synonyms and related terms, increasing your chance of results. You can view and adjust the search criteria at any time during your search. With Search! it is easy to search for specific parts of a person’s career. If you are looking for a project manager who has previously worked as a Java developer, Search! will find that candidate. This technology also enables you to identify career patterns, for example to improve the internal career progress in your organisation. What if you make a typing or spelling error in your search? No problem. Search! contains a unique database of language-specific HRM-related search terms. That means you will still find the right candidate even if you make a typing or spelling error. It is really easy to search your database by using facets. Facets are very user-friendly and are widely used on the Internet, for example by well-known travel and house & home websites. A facet classifies your candidates on the basis of criteria such as sector, number of years’ work experience, document date, availability, salary requirement and/or educational level. For each facet you can see the categories and the number of candidates in each category. Search! enables you to filter the results by one or more categories. The main keywords in CVs are displayed in tag clouds and dynamically updated. In this way Search! makes it even easier to apply filters for the most suitable profiles. Tag clouds are available for example for job titles, employers, education names, technical skills and languages. Search! enables you to search for candidates living in a particular region. You can enter a postcode or place name and then set the mileage radius within which the candidate must live. That enables you to optimise the search results on the basis of travel distance. Search! includes a worldwide database of postcodes and place names. With Search! you can apply a weighting to the various components of a search to fill a position. You can decide what kind of candidates need to appear at the top of the list. For example those with the right technical skills or those with experience in a particular job. In standard search systems you often get no results if you enter too many search terms. You then have to broaden or change the criteria. The inventive technology in Search! enables you to state which keywords or facets are required (must have) and which are desirable (nice to have). This can easily be adjusted during each search. 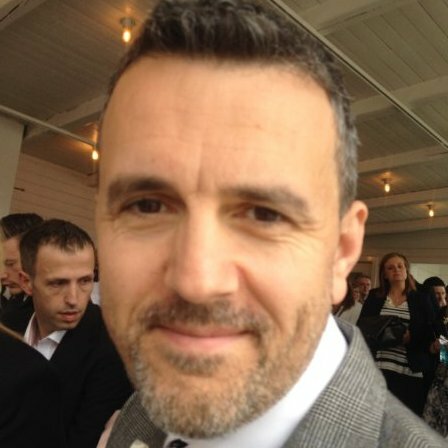 Textkernel uses machine learning techniques to learn from user feedback which search results are good and which are not. Being able to machine-learn a model allows for automatic tailoring of the ranking to a certain user’s preferences. Find out more on our technology page. LTR is an optional feature and can be added on request. Do you have no suitable candidates in your own database? No problem. Search! can simultaneously search external databases and social media such as LinkedIn, Xing, Monster and Github so you can always find the right candidate. In Search! you have the ability to create projects to store your search profiles and bookmark interesting results from your own database or external sources. 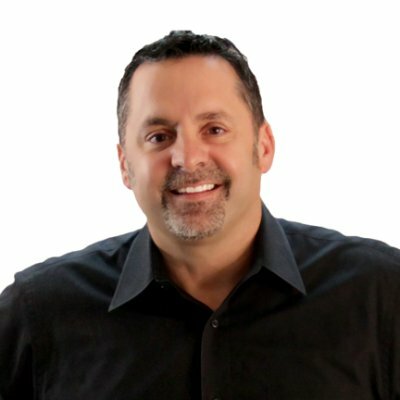 This allows you to create meaningful talent pools. When you add an interesting profile, found in your own or external datatabase, to one or multiple projects, the search result gets the tag of the project. A tag is a label that can be given to a result. The tags in your database can be used as search criteria or as exclusion criteria. You can create e-mail alerts to get notified when there are new matches to your search. Each day, week or month you will receive an e-mail with a a list of new results that match your search profile. You can share projects including searches and results with other users. You can choose whether you want to share your project with everyone or just one or multiple users. The tags you gave to candidates will also become visible to them in Search! The intelligent software has a clear user interface that takes the complexity out of searching. Search! visualises what you are looking for. It is easy to change or expand your search. You can also easily adjust the weighting of the various aspects (i.e. what you consider more important). Thanks to the user-friendly interface you will be able to find the best candidate in your database right away, even without any technical training. Search! has been enriched with domain-specific knowledge. Textkernel has developed and classified an extensive database including job titles, professions and qualifications. You can use our taxonomy or we can configure it to match the classifications in your own system. Search! is a web-based system. As well as being fast and flexible, it is also secure and reliable. Search! makes only limited demands on hardware. No complex software installations are required. With your personal login details, Search! is accessible 24 hours a day in real time via the Internet. Search! can be accessed both on the Internet (Software as a Service) or, if you prefer, can be installed on your local system. For Textkernel, privacy is of the utmost importance. With each new customer, we sign a data processing contract ensuring that data is not distributed to third-parties or used in any other way than agreed upon. For our external search (for example on LinkedIn and XING), we ensure that only profiles of people who want to be found via Google are displayed. We thus protect the privacy of users who do not wish to do so. The search screen in Search! can be adapted to your house style using CSS. This can then be seamlessly integrated into your existing application by means of an iframe. You can also use your own search screen. You then use the Search! API (via SOAP or JSON) to download the search results and display them in your application. Your CVs and/or vacancies, complete with database fields, can be transferred to Search! as XML using the SOAP index webservice. The authentication and authorisation module is linked to your existing system by means of a single web service. That means you do not have to multiple databases and you have exactly the same access rights in Search! With configuration files it is easy to add external search sources and social media. You can obtain maximum results with the semantic search option if you also use our Extract! HR application. Additional information is then linked to your CVs or vacancies. Search! is fast and scalable, enabling you to work with millions of documents. New information is indexed almost in real time. Every user is amazed by the rapid response time of searches. Search! works for all languages. The enrichment with domain-specific knowledge is currently available in Dutch, English, French, German, Italian, Polish, Spanish and Swedish. Search! is supported on browsers such as Internet Explorer (version 7 and higher), Firefox, Google Chrome, Safari and mobile browsers. Search! combines internal matching and sourcing of external databases (federated search). Search! includes both exact filtering and fuzzy and weighted results. 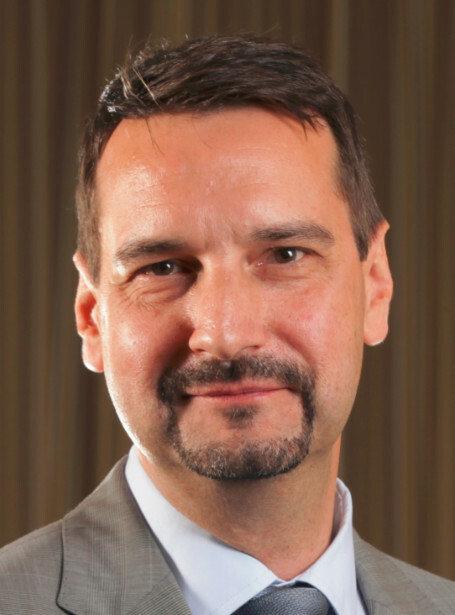 This combination enables Textkernel to rank the results relevantly. For further information on semantic searching and fuzzy matching, see our technology–page. When typing into the search box, you will get automatic suggestions for search terms. Not only will the semantic software give you ideas for words to include, it will also give you suggestions for the interpretation of search terms. With Search! you can filter candidates in your database by category. Facets can be created for each database field or derived criterion. These could include the number of years of work experience, a candidate's entry date, availability, salary requirement, qualifications, career stage, etc. The tag clouds offer an additional way of finding information by visualising it. You can then find candidates you might otherwise not have come across. You can also be certain that the person you are looking for is in your database. Tag clouds are ideal for clearly displaying varied information. The larger the word, the more often this term appears in your database. You can adjust your search, to obtain more or fewer candidates. You can do so by stating which criteria are required (must have) or desirable (nice to have). In Search! you can search more widely than just on your own keywords. Search! automatically includes synonyms and suggests related terms. Click on the search word to view the terms. How well your candidate matches your search, is presented by the score indicator. By hovering your mouse over the score, you will directly see which criteria your candidate does or does not meet. This way you will get even better insights into your results. With Search! you can easily compare candidates. 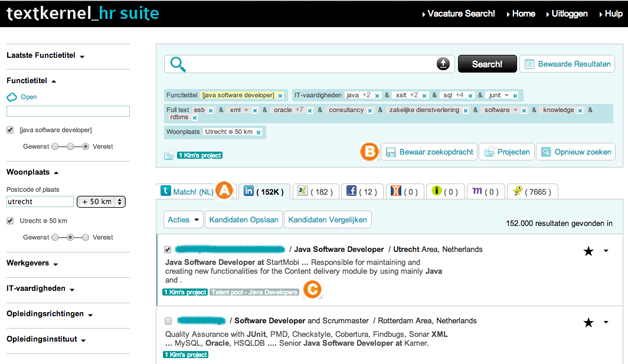 The 'compare candidate'-view gives you an overview of a selection of candidates and how they match your search criteria. This allows you to easily and quickly make a selection of the most interesting profiles. What if you do not have any useful results in your own database? Search! simultaneously searches external databases such as LinkedIn, Xing, Viadeo, or Monster. We can connect any external database to your Search! configuration on request. This makes Search! the ideal tool to help you with active sourcing. Under the button 'projects' you see an overview of all your projects and projects that have been shared with you, including the associated search profiles and saved results. You can share projects including searches and results with other users. You can choose whether you want to share your project with everyone or just one or multiple users. The tags you gave to candidates will also become visible to them in Search!.